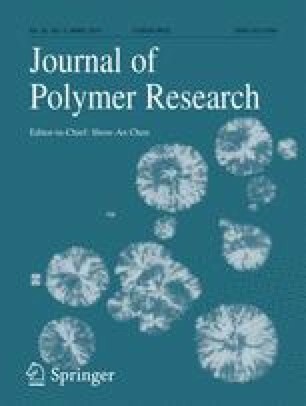 The effect of the addition of a novel thermoplastic co-poly (phthalazinone ether nitrile) (PPEN) on a blend composed of a difunctional resin, unimolecule diglycidyl ether of bisphenol A (UDGEBA), and a anhydride, methyl tetrahydrophthalic anhydride (MTHPA) was discussed in the present study. The blends were studied by Fourier-transform infrared spectroscopy (FTIR), Thermo-gravimetric Analysis (TGA), Dynamic mechanical analysis (DMA) and Scanning electron microscopy (SEM). FTIR studies showed that the curing reaction was complete in all systems. TGA studies revealed that the thermal stability of the epoxy resin marginally decreased by the incorporation of PEEN into the epoxy resin. The MTHPA-cured UDGEBA/PPEN blends have two Tgs measured by DMA. SEM observation also confirmed that the blends were heterogeneous. The Tg of the resin containing 5 wt% PPEN was slightly higher than that of the unmodified resin, and the value of the impact strength also increased about 59% compared with the unmodified resin. It is attributed to the phase separation and the composition of the blends. However, higher PPEN content caused the decrease of the Tg. In addition, the fracture toughness of these systems was equal to or only slightly higher than the unmodified resin. SEM observation of fracture surfaces revealed the characteristics of brittle fracture for the pure epoxy and the typical ductile rupture of the UDGEBA/PPEN blends. Therefore,the introduction of PPEN maintains the heat resistance of the epoxy resin while improving its toughness,which is beneficial to the thermo-mechanical properties.